The image gallery of bees and wasps contains by now more than 3.000 images. Most of the images are from living specimens but more and more fotos of specimens from collections are included. Each foto has the information about the photographer and almost all fotos mention the location where the foto was taken. 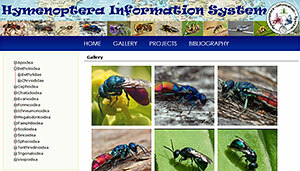 The reference library of the Hymenoptera Information Project consists of more than 10.000 entries. Here in the web-portal only those references are listed that are already analysed. The biggest part of the listed publications are about Pompilidae. This group with about 5.500 species is treated worldwide and so most references contains information about these wasps. This project has the goal to list all Cuban bees and wasps with synonyms, fotos and the literature containing information about these species. By now more than 1.100 species of bees and wasps are know from Cuba and more than half of the species belong to the parasitic wasps. Almost 100 species are already documented with at least one foto. The family Pompilidae is treated world wide and it has about 5.500 valid species and subspecies with more than 2.000 synonyms. The names are part of the Catalogue of Life and an export of the data is delivered regulary to this catalogue. The list of valid species and synonyms is still uncomplete and it needs further investigation to complete the catalogue of this family. The recent fauna of the family Rhopalosomatidae currently consists of four genera, and its distribution is largely limited to the subtropics and tropics. By now 79 species, including a few fossils, are known world wide. The taxonomic data is part of the Catalogue of Life. Cameron, in his fabulous work 'Biologia Centrali-Americana' from the years 1883 to 1900, published already a catalog of bees and wasps from Central America with 1.826 valid species and 114 synonyms. Most of these records were from Mexico, Panama, Guatemala and Costa Rica. Nowadays more than 13.000 species are know from Central America, withinin the equator and the 20th degree of latitude. The project "Fauna de Cuba" is a try to get an overview about all living species of animals in Cuba. By now we have in our database more than 15.000 species listed. 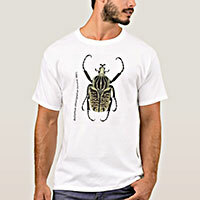 By far the most species are known from the group of insects with about 8.500 species. Also Cuba is taxonomically quite well known, many species are still waiting to be discovered. This project was started in the year 2014 while more than 50 specialists were collecting specimens in the United Arab Emirates. The result were published in special volumes and the ideas was creating an online catalog in addition to the paper published version. Due to lack of funding this project will probably not be continued.